I have been asked too many times on how to make a simple Chinese greens dish Chinese restaurant style…so here it is. The secrets, tips, and recipe to make all your vegetables taste and look picture perfect, just like top Chinese/Cantonese chefs do. Chinese greens with oyster sauce is an easy dish to prepare but not many can make it right. I have seen too many overcooked vegetable dishes served at homes and even at restaurants. Once you grasp the basic techniques and skills of making this dish, you can pretty much cook any vegetable or Chinese greens you want — choy sum, kai lan (Chinese mustard greens), bok choy/baby bok choy, or any green leafy vegetables. Without further ado, I unveil the following secrets, tips and tricks. Buy fresh vegetables – select the freshest greens available in your market, such as the baby bok choy shown in my pictures. Use garlic oil – I use a lot of garlic oil in my Chinese recipes. It adds a lot of depth to simple dishes and infuses the veggies with garlicky flavor and aroma. Use cooking oil wisely – Add a drop or two of cooking oil into the water before blanching the vegetables. The cooking oil coats the vegetables so they look fresh and green, not purple. Don’t kill your vegetables, they are already dead! – Don’t overcook your vegetables by leaving them too long in the boiling water. Perfectly blanched vegetables should be somewhat crunchy, not limp and wilted. Discard excess water from the vegetables before plating/serving – Drain the water from the vegetables so it doesn’t dilute the sauce. Excess water in the vegetables will make your vegetable dish watery. 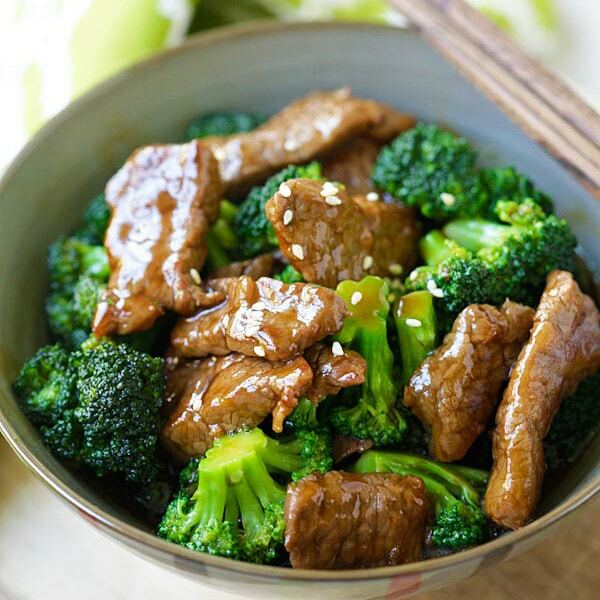 Now that you have the chops, complete your Chinese meals with a plate of fresh, green, and delectable Chinese greens. Trust me, vegetables never look or tasted this good from now on. For a wholesome meal and easy weeknight dinner, I recommend this dish paired with the following recipes. Restaurant-style Chinese Greens with Oyster Sauce Recipe - Read my 5 quick tips on how to cook Chinese greens. For the garlic oil, the garlic will continue to cook in the oil so as soon as they turn light brown in the wok, you should dish it out. Eventually, they will turn golden brown. 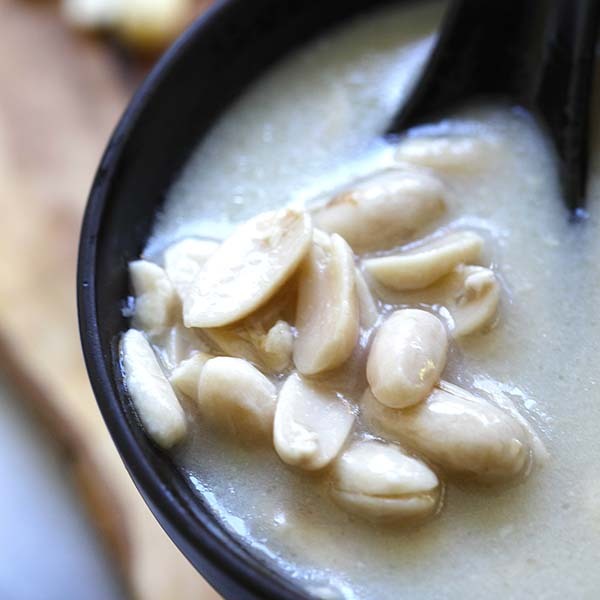 I love this dish… I had it so often in S’pore but I did not know how to make it. Thanks! So simple, so good looking, and so good! This a simple, great looking dish. I’m wondering if you use a carbon-steel wok or a cast-iron one? Great tip! I look fwd to trying it soon. I normally just blanch veg and add oyster sauce straight from bottle …my preference is Amoy brand. I know, sometimes things that look easy are a bit tricky to make. You’re the master of the wok! No question about that. 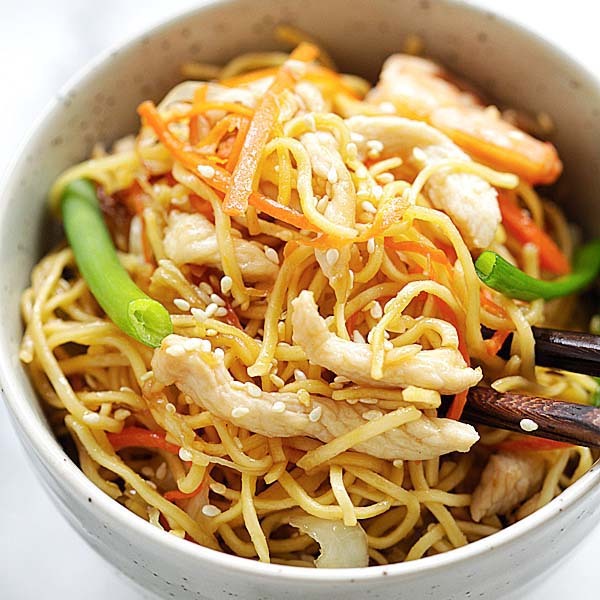 this is the most basic chinese dish, so easy to make yet so nice! 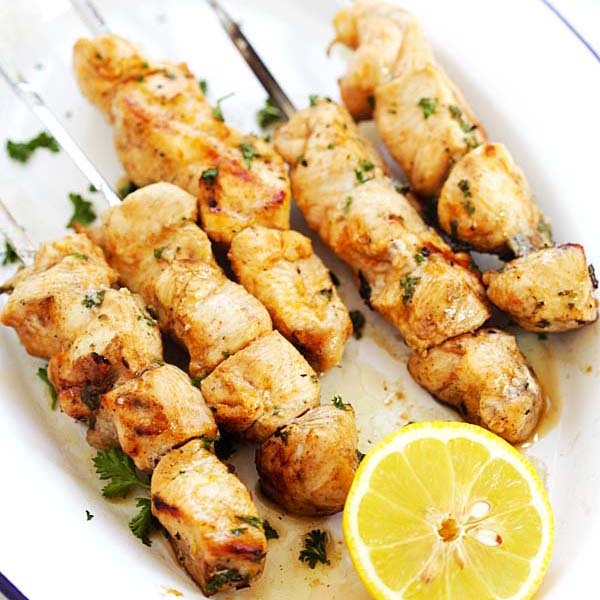 One dish that I will cook when I am hungry and lazy! Great tips! I too dread the overcooked veggies. My favourite vegetable cooked this way is kailan. We tend to use shallot oil rather than garlic oil at home, but both add lovely flavours. Garlic is less fussy to peel than shallots though! sounds so delicious! 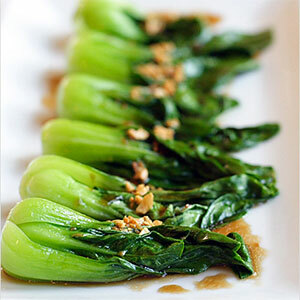 i had pak choi from the farmer’s market a month or two ago and roasted it with olive oil — i will try this next time! My mom taught me the “oil in the water” trick just last week when she cooked up a bunch of fresh gai lan. I never knew her secret until recently! Thanks for the simple recipe. How do I make garlic oil? Fry the garlic in oil and store up in oil? Or soak chopped garlic in oil? I don’t like to boil my veggies, so I usually steam them. It works best with soft veggies such as the bok choy. That’s how I normally prepare this dish. this chinese greens with oyster sauce looks so good. i will try making it using you chinese greens with oyster sauce recipe. Just would like to know if it’s ok to link this recipe to mine as source? I tried this and it’s great!. Nice recipe, now I can do the asian greens in ‘restaurant style’. My 5 min asian green recipe is usually: Heat oil and add crushed garlic until aromatic, then add the green veggies, oyster sauce, a little soy sauce and sugar. But now, I can do your style if I have dinner parties or cooking for the in-laws, to make it more presentable. 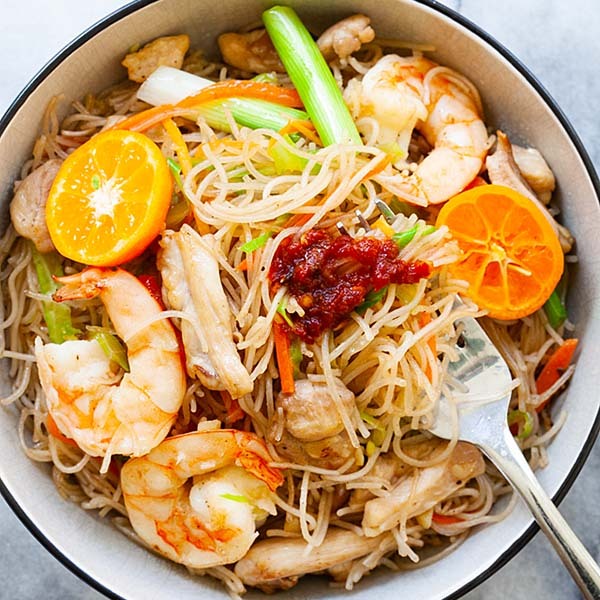 Great recipe, I do a dish similar to this but use a little rice flour to replace the sugar, and add a bit of crab broil to the cool water when dissolving the flour. This enhances the Oyster flavor and adds a bit of sweet thickness to the sauce. Very Chinese restaurant-style in my opinion. Love this dish…Also good with Pea Sprout greens. Wow that’s a very detailed post/recipe, thanks a lot! So simple and yet so effective. I cooked the bok choi for a bit longer than you said but it was brill and its another of your recipes that I’ll be doing again. Hi, Can you please confirm if that’s crushed peanuts on top of the bok choy in your picture?? It looks like it is to me but you never mentioned peanuts in your recipe? Use vegetable, peanut, or canola oil. No sesame oil added. Thank you for the advice! I’m enjoying your site a lot, given that it’s not that easy to get Straits food much around here, it’s good to have a place to come to for things to try out. Thanks a lot for sharing simple and delicious Chinese recipes. I followed exactly the whole recipe and it turned out well… Delicious. I made it a point to cook this recipe every week. I’m looking for Baby Kailan recipe and ‘Chap cai'(mixed vegetable) recipe. Keep up your good work. Just made this using standard mustard greens, it was great. It would probably be good using just about any vegetable in the “brassica” family. I had it with fried eggs on sour dough toast. Delicious!!! Didn’t have any white pepper so I substituted a few drops of siracha… Very good. Before anyone screams Adultery, let me say that Chinese and Cajun cuisine has been very popular in New Orleans for a long time but not highly promoted. And for anyone that hasn’t heard of this particular mix, try it once and laissez les bon temps rouler..(let the good times roll) Your baby bok choy recipe is a perfect match made in heaven for Louisiana Cajun Crayfish Tails sauteed in the same garlic oil with a few drops of liquid crab boil seasoning for spice (warning -this stuff is hot). and served along on top of your Baby Bok Choy Greens just as you wrote it. Kudos for a very detailed but simple recipe. Go Girl. Yes. This is great for fish and vegetables. Let me know if and how you like the other recipes you try. Love it! This has become a staple in my family. Made this with mustard greens and it was the first time I’ve really enjoyed eating them. Thank you! Yum. Family give me top ratings for this recipe. Simple to cook. 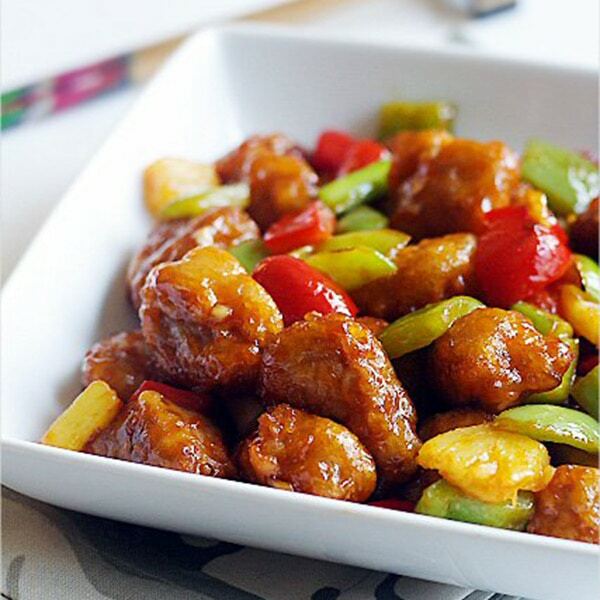 flavors are subtle and perfect dish to the rest of meal. Printed and added to our binder of favorite recipes – reserved for only the top 100 family recipes. Advise following the recipe, the greens only need a small amount of sauce. Hi Tom, thanks for trying this recipe.